Are you having a hard time selling to small businesses? Are you getting doors slammed in your face because small business owners don’t want to hear your sales pitch? I recently got an email from a viewer who is struggling with that exact issue in his business. Check out this video to find out what advice I have for him. Are you having a hard time selling to small businesses? Are you getting door slammed in your face because small business owners donít want to hear your sales pitch? Hi, Iím Carmen Sognonvi. I recently got an email from a viewer whoís struggling with that exact issue in his business. Keep watching to see what advice I have for him. By the way, if you want to get a list of the seven tools I rely on to run all of the marketing in my business, head on over to carmensognonvi.com/tools. Iíll tell you everything from who we use for graphic design and printing and Iíll even share with you a mobile app that allows you to track how your fliers are being distributed. Well Ron, you have my sympathies. 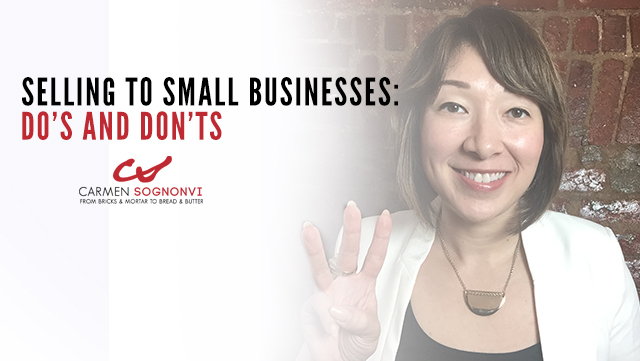 Because truth be told, selling to small business owners is one of the toughest gigs on earth. I know this from experience. Not because only I am a small business owner myself and I know how I treat sales people to be frank. But I have actually been in a sales position where my job was to sell advertising to small business owners in the home decoration, home maintenance kind of industry. And it was really, really tough. So, youíre not alone. Here are three ideas that I would share with you that may help you get better results. 1) Donít walk in or call. Now this make take you by surprise because you might think ìWell if I donít walk in or call, how am I going to make contact with them?î Well there are other ways. But let me first explain why walking in or calling is a bad idea. Number one: Walking In. As soon as someone walks through my door, I know immediately that they are there to sell me. Within one second I look at that guy and his cheap suit and his ugly leather portfolio thing and I am immediately on the defensive because I know heís trying to sell me something that I donít want and my only primary objective is to get him out of my business as quickly as possible. That is the harsh truth. Now if someone is calling instead of walking in, this is usually whatís happening on the other side of the line. In other words, youíre calling you know whatís happening on your end, on my end it looks like this. Iím talking to a parent of one of our students, the phone rings, I pick it up I excuse myself, I pick it up itís a salesperson. Heís trying to sell me something. The longer that I talk to this guy the more waiting my studentís parent has to do. So my primary objective is to get off the phone. Now even when I am not actually, physically face to face with a customer at that point that the phone rings, I still want to get him off the phone immediately. You know why? Because the longer I spend on the phone with him, the longer it takes for a potential prospect to not be able to get through and call my business. So, I never want to stay on the phone with a sales person. Because he is disrupting my business, heís getting in the way of me actually making money and delivering my service. So, that is why I recommend that you do not call and you do not simply walk in unannounced. So what should you do instead? I would actually recommend doing cold emails. Now, you may think to yourself ìOh but are small business owners really on email? They donít seem very tech-savvy. Blah, blah, blah. I think this is a huge misconception. People tend to think that just because you own a bricks and mortar business means that youíre some kind of Luddite dinosaur. Itís just not true. A lot of us are extremely tech-savvy and are running our businesses online in terms of communication. So, donít assume that just because someone has a bricks and mortar business they are not savvy enough to have an email account and know how to work that thing. Ok? Weíre using email. Trust me. Now the reason that email is so much better than calling or walking in is because itís so much less disruptive. When I sit down to check my email, Iím there for a reason. I am in kind of like a processing mode where Iím going through and reading things. And itís on my own time. So, itís not like Iím in the middle of something and then the phone rings and I have to stop what Iím doing to look at that. Iím already in my inbox, so Iím there to check email. 2) Donít copy and paste. What I mean by that is donít just write up a bland sales pitch and then copy and paste the same thing over and over again to every single business. What you want to do instead is actually start with picking one particular type of business or industry. So, for example, restaurants. Now, you want to actually hone in on a particular problem and explain why what you offer can be a solution. So, youíre in the photography business. One thing you could do, for example, is to email a restaurant and say ìHi, I noticed that on your yelp page you have fewer than ten reviews. It could be possible that this low amount of activity is because you donít have any photos of your dishes on your yelp page or on your website. Studies have shown that restaurants with photos of their dishes get 50% more reviews than restaurants that donít have photos.î Something like that. I made up that statistic, by the way. Basically, you want to point out a specific problem that you see potentially and explain how your service can actually solve that problem. Because the thing is with photography, business owners donít lay awake at night in bed thinking ìIf only I had better pictures!î Thatís just not something that happens. Now photography, we know itís important, we know itís nice to have but it tends to be on the bottom of the priority list. I mean even in our business at Urban Martial Arts, we are very visually driven and Iím all about good design and branding. And even with us, itís been 3 years since we did our last photo shoot, in terms of the karate program. So, even I whoís very visually inclined, am procrastinating big time on getting new photos done. So, the more that you can pinpoint a pain point and explain how your service can help with that, the better off youíll be. 3) Donít forget to make an offer. And hereís another secret that Iíll let you in on Ron, small business owners may tell you that they have a marketing budget, but really we donít have marketing budgets. We have a rough idea of how much we spend on marketing each month but if something cool comes along and we think itís worth investing in we will find the money to pay for it. Thatís how it is. Because, guess what? We run the show. We are the boss. We donít have to get it approved by 14 corporate layers. We pull the trigger. We make the decision. So just because someone says ìOh itís out of our marketing budget.î Thatís just means that theyíre not interested. If they are actually interested they will find the money to pay for it. So thatís an insider tip for you. So now that you followed those 3 tips, one thing that you want to keep in mind is donít forget to follow up. This is really, really important because guess what? The fortune is in the follow up. Youíve probably heard that phrase. The first email that you send is going to be very easy for me to ignore. When you follow up with me a first time, Iím going to think to myself ìHuh, alright maybe I should respond.î If you follow up with me a second time and I didnít respond to you the first time, then Iím going to be like ìWow! This person is really standing out from the crowd. He is really following up.î And at that point Iím probably either going to get back to you and have a conversation or Iím going to let know that this is something Iím definitely not interested in because I donít want to hear from you anymore. But either way you have a specific answer; you have a response which is better than no response at all. So, donít be afraid to follow up if you donít hear back. I would follow up at least 4 times. So you send the initial email and then send 4 follow ups. And leave anywhere from 3 to 5 business days in between each follow up. So if you donít get a response then follow up. Because weíre busy and just because we donít respond the first time doesnít mean weíre not interested. Maybe we are but we werenít interested enough to kind of leap off our chair and get back to you right away. But if you keep following up then youíre going to see much better results. Ok! So if you found this video useful, I would encourage you to get email updates from me. Just head on over to carmensognonvi.com/newsletter and sign up there. And if you have a question you would like me to answer in a future video just email it to me at info@carmensognonvi.com. Ok, itís time for some shout outs and weíre doing another Instagram edition. So, if youíre not already following me over there my handle is @carmensognonvi. So I want to shout out @fullertonphoto, @deliachristianastamate, @growthhackwizard, and @roseann517 who is actually a parent at our karate school. So thanks for following me there Roseann. Thank you all for your lovely comments. Iíve linked up to their profiles below so the rest of you be sure to check them out. And again thanks for watching.